In Jesus’ day corruption was everywhere. I realized as I read this morning that today’s chapter is bookended with a fascinating parallel. It begins with the story of Zacchaeus. Zac was a “chief tax collector.” In the days of Roman occupation, the empire broke up territory into tax regions. The tax collectors were locals who knew their neighborhoods, local businessmen, and had first hand knowledge of where the local money was. Tax collectors had a base amount of tax that the Roman Empire demanded they raise and send to Rome. There were, no doubt, others in the regional political machine getting their cut, but beyond that the tax collectors could keep whatever they could extort from their own people. The more money they squeezed out of their neighbors the richer they became, and Zac was a very wealthy man. 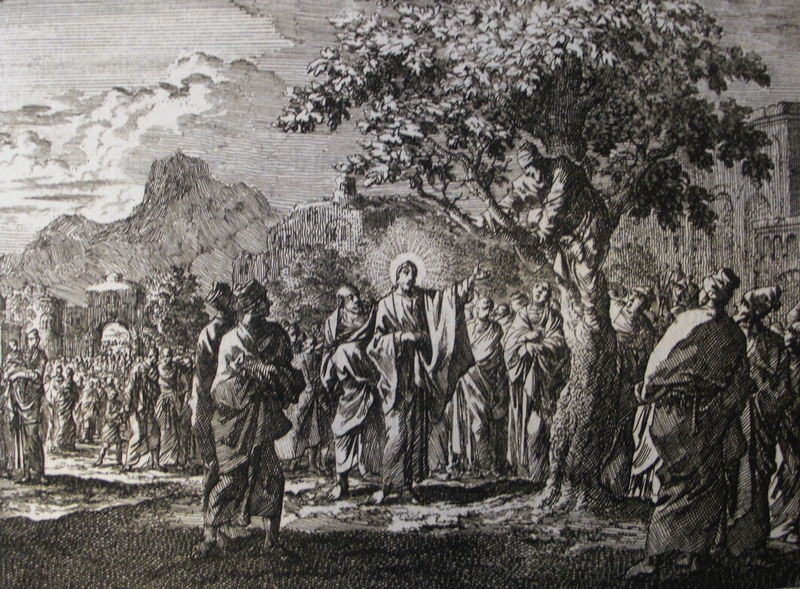 As a “chief tax collector” Zacchaeus would not only have extorted his own share, but he was likely getting a piece of the action from other collectors in his territory. He was a extortionist and racketeer, the first century equivalent of a local mob boss. Contrast this with the Pharisees and religious leaders who ran the temple. They judged Zacchaeus as a traitor and a sinner and they would look down their ecclesiastical noses at the extortionist. But, the religious leaders were total hypocrites. They had a thriving racket of their own. Good Jews were required to make regular pilgrimages to the temple to make sacrifices and offerings for their sins. Jews regularly came from all over the known world to make their annual sacrifices. To take advantage of this, the Pharisees in charge of the temple minted their own currency and the priests demanded that people buy the supplies for their offerings from the approved temple merchants. Of course, the temple merchants only took temple currency, so people would have to visit the temple “money changers” to exchange their local currency at exorbitant exchange rates. At least with Zac and the money changers there was no pretense about what they did with their money. The high priest and the religious leaders were corrupt extortionists, but they cloaked their racket in pious religiosity. They used God to launder their public image and both social and religious leverage to line their own pockets. Jesus visits Zacchaeus’ house (creating all sorts of gossip, whispers and condemnation from all the good religious people). By the end of the visit, Zac’s heart and life had changed. He agrees to give away half of his wealth and make amends with all whom he’d cheated (the list was likely to be very long). Jesus visits the temple. Unlike the sinner, Zac, the Pharisees and religious leaders refuse to repent of their extortion and racketeering. They choose, instead, to plot to have Jesus killed. 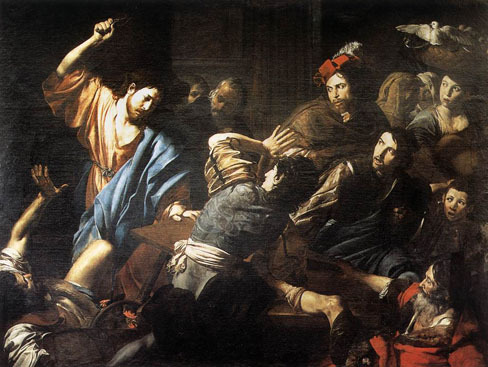 His teaching, and his driving of the money changers from the temple were a threat to their power and their income. They would have none of it. Jesus needed to be rubbed out. God’s Message teaches that sin is common to all. Both the tax collectors and the religious leaders were infected with the same appetite for greed and power. There was no difference in their sin, only in their response to Jesus. The traitorous “sinner” Zacchaeus opens his heart to Jesus’ words and turns away from his racketeering ways. The good religious people close their hearts to Jesus’ words and sink to even lower into corruption in order to safeguard their wealth and power. Today, I’m thinking about the contrast in these two stories. I’m aware some people think of me as a good, religious person like the Pharisees, but I don’t ever want to be like the temple leaders who played a religious game to hide their lust for wealth and power. I’m also aware that some religious people think that I am not being religious enough and I don’t tow the line on their religious standards. I am divorced, I have tats, I don’t hide my love for a pint of good beer and an occasional cigar. And, I hang out with those sketchy artists and theatre types. I am admittedly not perfect, but I hope that, like Zacchaeus, my heart and soul will always be open to Jesus’ teachings and that my life will always be enthusiastically responsive to Spirit and Truth. I mentioned last week that I appreciate Luke for the small details he researched and added into his telling of Jesus’ story. The opening of today’s chapter is an example. 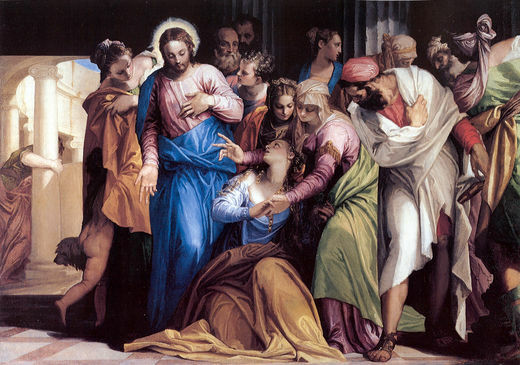 Luke is careful to point out that Jesus was accompanied, not only by the twelve, but also by some women whom Jesus had healed. When reading “Joanna the wife of Chuza, the manager of Herod’s household,” Luke’s contemporaries would have read that description and immediately understood that Joanna was a woman of means. Herod was a regional king ruling under the authority of the Roman Empire, and managing Herod’s household would have been a well paying position. Luke points out that the women were traveling with Jesus and helping to support Jesus ministry financially. This little detail fascinates me. In Jesus day, women in Palestine had very low social status. The Jewish culture at that time, it can be argued, was misogynistic. Women were treated with contempt and good Jewish men could be heard reciting ritual prayers thanking God that they had not been born Gentiles (non-Jews), dogs, or women. I can’t imagine how that made women feel when they heard their husbands reciting such a thing. Jesus, however, cut against the grain of the contemporary culture. He spoke with women in public which scandalous in that day. He socialized with broken women of ill-repute and treated them with love, compassion, and forgiveness. He did not discriminate in performing miracles. He was not only seen publicly healing men, but also touching and healing women of their infirmities both physical and spiritual. Jesus didn’t fear wrath and ridicule for these things, and He received a generous dose of both. Jesus did what was right in the face of popular culture and treated women with the love, honor, and respect that is due to all daughters of Eve. THAT is the Jesus I follow and strive to be like. In giving us this detail, Luke also clues us in to how Jesus’ traveling ministry operated financially. At least part of the funds required to support Jesus and his followers came from the financial means of his followers, women of means in particular. The principle here is simple. Jesus followers and those whom He healed gave out of their gratitude to support Him and His ministry. It should be no different today. I give regularly to the on-going work of Jesus, not out of blind obedience, guilt, or shame, but out of gratitude for what Jesus has done in my own life. Another thing this little detail makes me think about is the case of Joanna. Her money was coming directly from Herod’s palace. Herod was a corrupt, evil, murderous tyrant. I can hear the conversations of Jesus’ followers around the fire at night arguing whether Jesus should accept such “dirty” money. Doesn’t that come from evil means? Isn’t accepting that money just a vote of support for Herod and his evil ways? There is no mention of Jesus having any qualms about accepting Joanna’s gifts, despite the fact that it flowed from Herod’s coffers. There is a timeless, on-going debate about the financial inequalities among peoples and social groups. Financial inequalities existed in Jesus’ day. In fact, it can be argued that the inequalities were even more extreme than what we experience in modern western culture. Yet Jesus’ own ministry would not have been possible were it not for the financial support of followers who were among the rich of that day. I find it interesting that while Jesus taught constantly about money, the teaching was almost always focused on the spiritual connection between individuals and their finances. Jesus never spoke out about the corrupt Roman tax system, but He spoke to individual tax collectors about not using the system to extort money from others. Jesus did not condemn the rich for having money, but He did warn individuals that their love of money was leading them down a spiritual path to condemnation. The only time Jesus made any kind of broader statement was with regard to the extortion racket being carried out by the religious leaders in the temple. This morning I’m thinking about Jesus, who showed love and compassion to those His culture did not love. I’m thinking about Jesus, who was not as concerned about the macro economic and political issues of this world, as He was about the micro-spiritual connection between our money and our hearts. I’m thinking about Jesus, whom I want to emulate in my thoughts, words and actions this day.